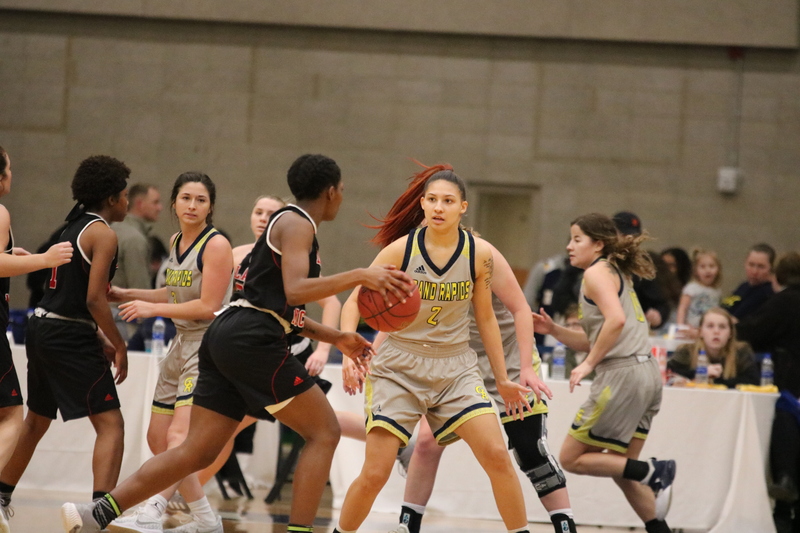 The Grand Rapids Community College women’s basketball team made a late comeback against the Kellogg Community College Bruins on Friday night at Gordon Hunsberger Arena. The Raiders had an eight-point lead in the first quarter and an even larger lead of 12 points in the second quarter. Sophomore guard Hallee Breimayer hit a long three-point shot in the second, followed by freshman forward Rayven Mondy’s three to give the Raiders a 27-15 lead. The Raiders were up 29-21 coming out of the half, as freshman guard Madelynn Miller opened the third quarter with a three-pointer. A technical foul on Kellogg was called in the same quarter and sophomore forward Mya Jordan made both her free throws, then another technical foul was called against the Raiders to end the third quarter still carrying a 45-42 lead. The Bruins began the fourth and final quarter by hitting a three to tie the game. The Bruins’ two-point lead with less than two minutes to play was the largest they had all night. Breimayer made a successful block to regain possession, and took the ball back into Raider territory. With less than a minute left to play, and a four-point Raider lead secured following Breimayer’s possession, Miller took a hard hit to the knee and sustained an injury. Miller’s injury will be evaluated again on Monday, and head coach David Glazier is hoping for the best. Sophomore Emily Pendred was the game’s highest scorer, dominating with 18 points and 16 rebounds. “(Rebounding) is something I’ve been working on, so just being able to do that tonight was huge for me,” Pendred said. The Raiders held onto their lead and went on to beat the Bruins 58-54. The team will be back in action at Kalamazoo Valley Community College on Wednesday, Jan. 30 at 5:30 p.m. in Texas Township, Michigan.